Wellington welcomed a world champion home Saturday as International Downhill Federation street luge star Kolby Parks celebrated with well over 100 people at Highline Hall. In his 10th season on the World Cup circuit, Parks completed his ascent from 74th among all competitors in 2008 to first last year. He joined his well wishers as they watched an award-winning short documentary, Kolby Parks – Downforce, produced by Aaron and Angela Bell that chronicled a journey from an instant love of the sport to becoming synonymous with it. In a voiceover above home camera footage of skiing tricks from his youth, Parks said that he’s always loved going down hills. He’d be the first on the toboggan hill in the morning and the last one to leave at night. He recalled that in the summer of 1997, a friend suggested he watch the X Games and the first extreme sport he saw on the television was the street luge. “In two or three seconds it clicked, that’s what I’m doing,” he recalled on film. Quickly, he converted an old skateboard for his purpose. He’d spend hours working in the garage with his dad, Gary, perfecting designs and cutting breaks. On Sunday, all of those boards were lined up for people to view, alongside the more professional models that came as his career progressed. 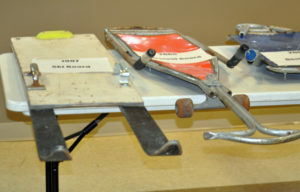 After securing a professionally built luge and some leathers off eBay and making his own brakes — often a combination of Converse sneakers and automotive brakes “used Fred Flintstone style” — Parks recalled in the documentary how he raced in Ohio in 2006 against David Dean, a legendary racer, in a match-up he likened to Sidney Crosby facing off against a minor hockey player. He crashed hard into the first corner that day. Fast forward to the end of the 2017 racing season, however, and Parks, a top-five finisher the world who has raced on four continents was again lined up against Dean in Ohio. On a slick track, Parks had his rain wheels on and he drew the inside lane. He recalled on film that he forced his rival to go faster than he wanted to and he took victory. That race, he said, stoked the fire for the best season of his career. “That race I’d won was the first time David Dean had last in Ohio in a decade or so. Winning that race gave me the motivation through the winter to train really hard and prepare for the season. I was able to train here at the arena through the winter. I was really, really focused on trying to win this year,” he said. The training included weightlifting at Ameliasburgh’s Victory Barbell Club for explosive strength off the start and a lot of long solitary nights on track at Lehigh Arena. It also involved lifestyle sacrifices. He’d also ordered a lighter luge from Italy that likely helped his push off the line and his turning through the corners. That coupled with trucks and wheels he was able to hone and refine was a factor when many of the top racers in the world were going down the hill at well over 100 kilometres an hour. “The new pieces of equipment were an edge as most of our races were won or lost by a couple feet,” he said. Parks started the year with a series of second-place finishes in Korea, Romania and the Czech Republic. No one had really pulled ahead. In Italy, he claimed first place in a World Cup event and he figured the championship was his to lose. In the United States, he rattled off two firsts and a second and thought his title was guaranteed. With another racer giving chase by doing a number of events in South America, Parks made a special emergency trip to Brazil, where he won a World Cup entry to secure the top finish. Saturday, he thanked his parents and sister for their encouragement — his mom, Nancy, for “generally not stopping me from doing it” — and teammates and competitors he’s developed camaraderie with over the years. 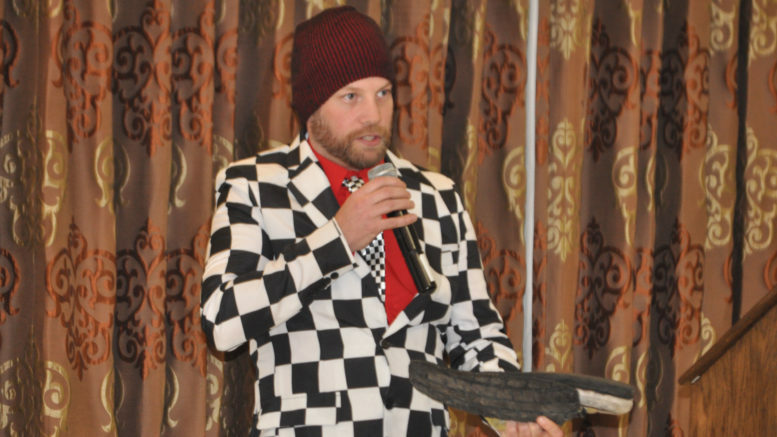 The many who helped Parks’ dream to show off the sport in Prince Edward County through Picton’s Gravity Fest in 2010, 2011, 2012 were also recognized for their support. Some questions turned to what Parks can do now that he’s reached the top. Obviously, he’d like to stay there. Also, he’d like to see his sport grow. He talked about training a crew of athletes to travel to races and encourage new riders. This year, he’s also looking forward to the World Roller Games race in Spain, which is a showcase for the International Olympic Committee. Parks, who wore a checker-flag coat and a Canadian flag kilt and socks Saturday, said he plans to race there for his country and he’d love to see the day where his sport is on the world’s biggest athletic stage. Meanwhile, Parks will continue to compete for the foreseeable future. He has some races in Australia lined up for April and he’s used to the life of working as an educational assistant and penny pinching to caravan around camping and competing. He’s also managed to set an example for those who will roar down the roads long after he’s hung up his board. Wesley Koch, a Montreal youth who is one of Canada’s youngest racers, came over three hours to pose with one of his heroes. Parks relayed another story of a young fan whose family moved from Toronto to Picton and excitedly told his mom that’s where Parks lives. It’s a pretty special position, earned through hard work, sweat, and the occasional bruise.